Like Europe’s far-right parties, Perry is hoping that hostility to immigrants will energize the base. The last time, on June 23, that Christie Watch paid attention to Texas Governor Rick Perry’s presidential hopes (“Will Rick Perry’s Comedy Show Be Renewed for Another Season?”), it was pretty hard to take the gaffe-prone, oops!-inducing, goofy Texan seriously. A month later, nothing’s changed, except that Perry has moved from circling around another national run to diving right in. And, although the competition is stiff, Perry seems to be angling to be the GOP’s most conservative, hawkish, in-your-face anti-Obama partisan in the race—which takes some doing. So why is it important to keep track of Perry, who’s mired in the low single digits in most polls? Because the views that he’s been expressing lately are downright dangerous, and he could succeed in pushing the GOP field even further to the right. That’s especially true in connection with immigration, where Perry is separating himself from the more establishment-leaning Republicans who might look for a compromise with President Obama on the issue—at least, if they weren’t under pressure from the Tea Party and from those espousing radical, anti-immigration views. Perry is scrambling to lead those forces now. We’ve sent the message that if we don’t get the satisfaction that the federal government’s going to move and move quickly, then the state of Texas will in fact fill that void. In a dramatic, grandstanding gesture on returning to Texas, Perry proclaimed that he’s dispatching a thousand members of the Texas National Guard south to the Rio Grande Valley (“As governor of Texas, I’m activating the Texas National Guard”), a move that Texas Democrats said will cost the state at least $12 million a month and do no good. But Perry, like many of Europe’s far-right parties, is appealing to nativist, anti-immigrant fervor among the Tea Party and the GOP ultra right, contrasting his harsh anti-immigrant stance with President Obama’s pro-reform stand. And he blamed Obama, who recently paid a visit to Texas—and met with Perry to discuss the growing problem of unaccompanied young children entering the United States—for the fact that Latin American workers and their families want to come to America. It’s a sharp tilt to the right for Perry: Back in 2012, of course, Perry expressed views that were far less hostile to undocumented immigrants, especially children, than what he’s saying now, and he was pilloried for it by other candidates; so, it appears, Perry isn’t going to make that mistake again. At the same time, in an effort to outflank his Tea Party competitors such as Senators Ted Cruz and Marco Rubio, Perry has decided to take the lead in demonizing the foreign policy views of libertarian/isolationist Senator Rand Paul. He kicked off the assault with an op-ed in The Washington Post on July 11, in which the Texas governor blasted the Kentucky senator for advocating “a giant moat where superpowers can retire from the world.” Instead, Perry called for US airstrikes in Iraq plus “intelligence, surveillance and reconnaissance sharing.” Paul hit back at Perry in a Politico op-ed, calling Perry “stuck in the past,” but Perry was widely praised by the dominant hawkish and neoconservative wing of the GOP, and it touched off a battle, becoming increasingly nasty, within the Republican party that promises to intensify. And despite Paul’s principled stand against American interventionism, he’s likely to execute a tactical retreat on foreign policy and national security issues under pressure from Perry, Rubio and Cruz, along with Chris Christie, who’s opted to adopt a mostly neoconservative, pro-Likud foreign policy, too. “I will tell you this,” [Perry] added, his voice growing louder. “If the federal government does not do its constitutional duty to secure the southern border of the United States, the state of Texas will do it!” The activists rose to their feet and cheered. Perry had scored a touchdown. What he lacks in sizzle from 2011 he’s making up for with newfound substance on issues such as the economy and turmoil in the Middle East. … He sat on a panel in January with former United Nations secretary general Kofi Annan at the World Economic Forum in Davos, Switzerland. Next month, he flies to China for his second World Economic Forum and is planning a fall trip to England, Poland, Croatia, Romania and the Baltics. 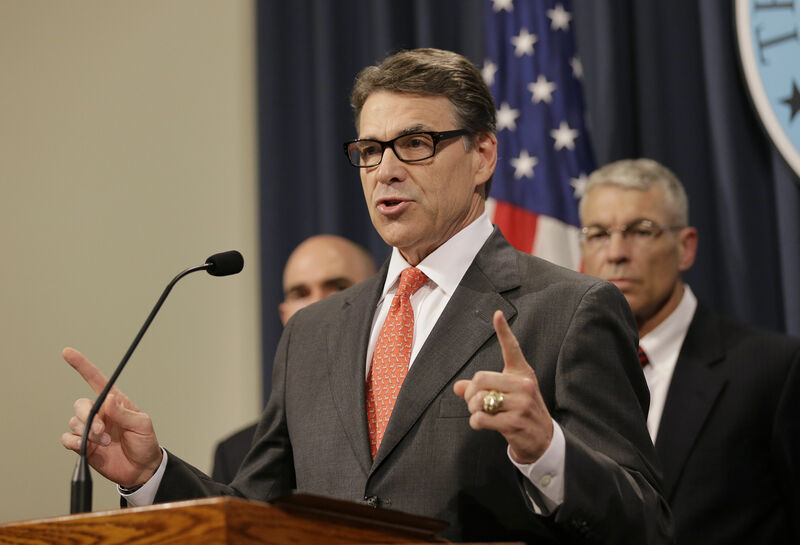 Since Perry’s 2012 debacle, many observers have tended to write off his chances. But whether one agrees with him or not, he seems to have enough raw talent, combined with the benefit of past experience, that blowing him off might be premature.